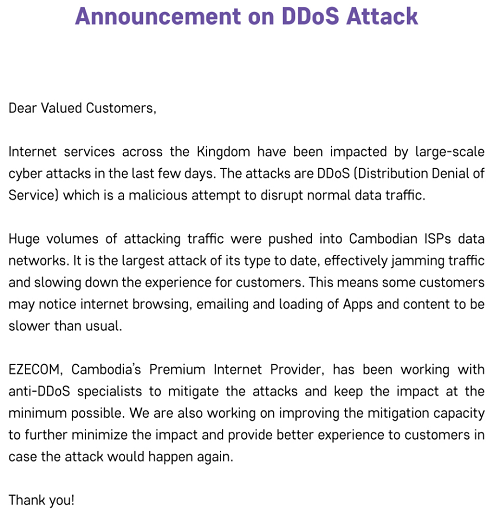 A major DDoS attack hit Cambodia’s top ISPs, writes ZDNet. EZECOM, SINET, Telcotech and Digi have all confirmed the attack after users reported issues all last week when trying to use online applications. The attack’s peak was on Nov. 5 and 6, when it almost reached 150Gbps, according to sources, causing at least half a day of downtime and disrupting internet access across the country. Local media reported this security incident as one of the biggest in the country. “EZECOM has been hard at work with anti-DDoS specialists to deal with this issue, and we expect normalcy to return soon assuming no further large-scale attack,” reads the press release. EZECOM also provides DDoS mitigation services, so its inability to secure its network against a DDoS attack may have hurt its credibility and reputation among customers. “The first ISP, who received ISO certification and own the first submarine cable system in Cambodia, offers enterprises and businesses powerful tool to strengthen network security from the attacks known as distributed denial of service (DDoS),” local media wrote about EZECOM last year. 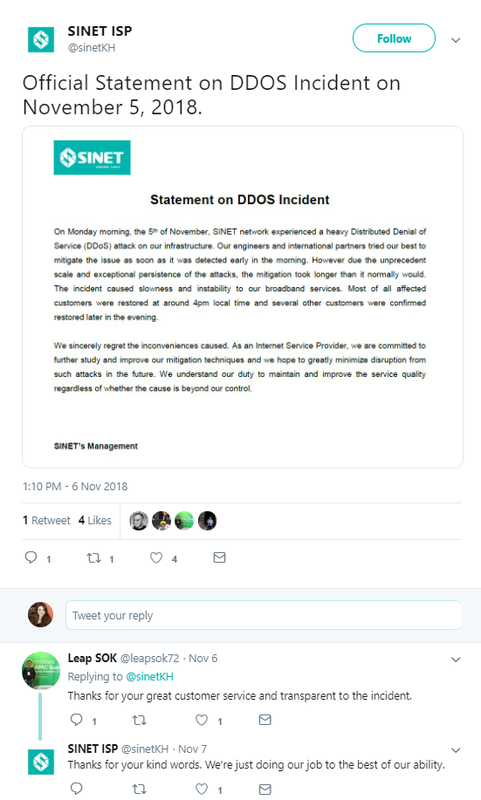 SINET ISP also confirmed the DDoS incident and apologized on Twitter. No hacker group has claimed the attack. As there are no ransom demands and the culprits are unknown, motive remains a mystery. DDoS attacks are on the rise. In 2018 they were more frequent than in the previous year, affecting business productivity and efficiency, and online operations.